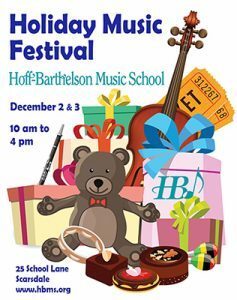 The Friends of Hoff-Barthelson Music School usher in the holiday season with the annual Holiday Music Festival and Holiday Boutique. This family-friendly, community event takes place on Saturday, December 2, and Sunday, December 3, 2017, from 10 am to 4 pm. Visitors to the Festival will find boutique shopping; raffles; a mini-silent auction of tickets to Broadway shows, concerts and sporting events; fabulous international cuisine; and music performed by the School’s stellar ensembles. Fun for the entire family, the Festival, is open to the public and free of charge. Bid on tickets for the upcoming Broadway productions of “Carousel” and “SpongeBob Squarepants,” vouchers for performances at Carnegie Hall, a concert performed by the New York Philharmonic, tickets to a NY Knicks game, among others included in the silent auction. An assortment of items up for raffle include toys and gifts for children, gift baskets, wine, a violin case as well as the hottest new things! Raffle tickets may be purchased for $5 each or five tickets for $20. Enjoy the tasty dishes and luscious desserts of an array of international cuisine — everything from French to Korean to Latin American and more – all cooked and served by Hoff-Barthelson parents. Music will be provided throughout the Festival by the Hoff-Barthelson Jazz Ensembles, Brass Club, Chamber Orchestra, Flute Orchestra, Chamber Choir, Wind Ensemble, Suzuki Strings, Viola Club, Symphonette and Chamber Ensembles. Proceeds from the Holiday Music Festival benefit programs at the School and financial aid. The Friends of Hoff-Barthelson, the Parent Organization of the Music School, hosts events throughout the year that support the educational and fund-raising goals of the school. The organization seeks to do this by creating a supportive and welcoming environment, providing programs to assist parents and children in navigating their musical journey, and promoting community involvement. Hoff-Barthelson Music School has achieved national recognition as a premier community music school for its unsurpassed leadership in education, performance and community service. With a faculty drawn from the region’s most talented teachers and performers, the School has long been one of Westchester County’s most cherished cultural resources. Open to people of all ages and abilities, Hoff-Barthelson serves as a center where anyone can pursue their interest in music and reach their highest potential. Students encounter a vibrant, nurturing community of music-makers, often forming relations that last a lifetime. The School will celebrate its 75th anniversary in 2019-2020. Programs of Hoff-Barthelson Music School are made possible, in part, by ArtsWestchester with support from Westchester County Government, and the New York State Council on the Arts with the support of Governor Andrew Cuomo and the New York State Legislature.